Engr. Chidi K.C. Izuwah Snr started his career as a lecturer in fluid mechanics, fluival hydraulics and hydropower engineering at the University of Port Harcourt, Nigeria in 1986. Thereafter, he held several senior oil & gas asset management positions in a career spanning over 21 years with SPDC (Shell Nigeria) and Shell International USA and Europe. Chidi is currently the Ag. Director General/CEO of the Infrastructure Concession Regulatory Commission in the Presidency awaiting confirmation by the Senate of the Federal Republic of Nigeria. He is a frequent speaker at Infrastructure Finance, Islamic Finance and PPP conferences. Chidi has a first degree in Civil Engineering from the University of Nigeria, Nsukka and a Master’s degree in Hydraulic Engineering from the University of New Castle Upon Tyne in the United Kingdom. Chidi is a Harvard, Wharton, Columbia University and Indian Institute of Management Ahmedabad Executive Education Alumni. 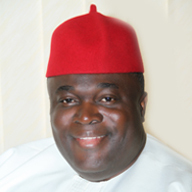 Chidi is currently the Chairman of the Nigerian Society of Engineers Presidential Committee on Infrastructure and PPPs. He is the co founder and Chairman Board of Trustees of the OLG Health Foundation and Autism Centre in Port Harcourt and Abuja. He is also the Founder/Chairman of the Defeat Autism In Nigeria (DAIN) Advocacy Project. Chidi is married to the very resourceful Dr. Mrs Doris Izuwah, a Pediatrician and they are blessed with three Children Chidi Jnr, Angelica and Michelle.